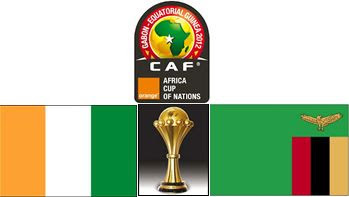 The Africa Cup of Nations football final is being played tonight at 19:30 GMT at the the Stade de l'Amitie, Libreville. Of the two teams contesting to crowned, Ivory Coast has better chances over rival Zambia. Both have played finals thrice but haven't won. Ivory Coast is being dubbed as favourite since it is the top-ranking team of the current tournament and is star studded with presence of Drogba, Yaya Toure, Gervinho and Didier Zokora. Zambia has a very slim hope to win and some say that even the Zambian players also are aware of it. The Zambians will also be contesting their third finals, after finishing as runners-up in 1974 and 1994.